You are here: Home / My Journey / What Do The Final 100 Days of 2016 Look Like For YOU? What Do The Final 100 Days of 2016 Look Like For YOU? There are 100 days left in 2016! Do you take time during the changing of the seasons to reflect? For me it’s a natural time to look back and use it as a checkpoint to see if I’m on pace to achieve the goals I have set for myself. The rhythms of the season are a reminder of where I’m at, where I’ve been and where I’m going. So many times we start the year with higher energy and a ton of motivation to make positive changes. We make up our minds and set our will to lose weight, learn a new skill, start exercising, landing a new job or any one of a hundred other things. Just because you may have had some challenges over the summer or stumbled doesn’t mean you have failed. If you are still breathing, struggling and fighting it means you are alive! It means you still have a chance to stand up and move forward. 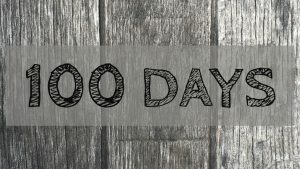 Now is the perfect time to look at the next 100 days and ask yourself; will I finish strong? Will I end this year strong? Will I move closer to the dream and life that I have envisioned? Over the next three and a half months will I push harder and make steps towards my dream? Why – I’m thinking back to January and remembering why I set the goals I set for myself. Reading – Setting aside time each day to read motivational blogs and inspiring stories. Listening – Loading up my podcast library with new podcasts that feature content from people who have faced struggles but have overcome and kept pursuing their goals and dreams. So…renew your focus and be determined to finish out 2016 strong!